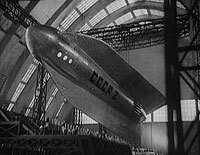 Kosmicheskiy Reys (1936) - Sci-fi-central.com. Soviet Union  1936  70m   Directed by: Vasily Zhuravlyov.  Starring: Sergey Komarov, K. Moskalenko, Vassili Gaponenko, Nikolay Feoktistov, Vasili Kovrigin, Andrey Karasyov, Sergei Stolyarov.  Music by: Franz Liszt. Scientist Pavel Sedikh grows impatient with the restrictions of the conservative Soviet space institute in Moscow. 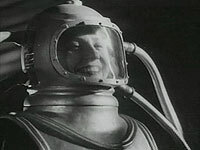 He builds his own spacecraft, and accompanied by a female astronaut and a boy, he embarks on a the first human trip to the moon. 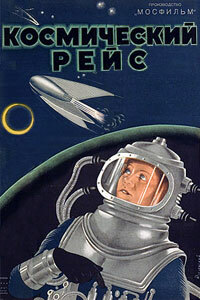 The print of this incredibly rare Soviet space exploration film I saw came without translated title cards. Since I can't speak Russian, I'm judging this on a purely visual level. 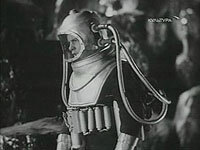 The basics of the storyline seem simple enough and the acting seems good enough (I've seen Fritz Lang's "Woman in the Moon", which seems to be a source of inspiration), but still, since I couldn't pick up on many of the characters and how developed or not they are, I could be wrong with any assessment in this department. Interestingly enough, since I wasn't weighed down by the storyline, the propaganda aspects seem all the more apparent. It makes me wonder if Sergei Eisenstein's films would be less subtle if I couldn't understand the story dynamics. The themes of workers cooperating in union to advance their cause seems to be the main theme of the story (when building up the rocket, no one ever seems to be in command of the final project). The main point of interest for me outside of the propaganda were the visuals. 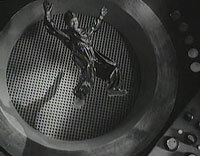 While primitive by today's standards, the special effects of weightlessness in space, the incorporation of animation, and especially several mind-blowing tracking shots were all incredibly advanced for their time. They often remind one of Georges Melies, the fantasy master of silent cinema. Even if you don't speak a lick of Russian, this may be compelling for its technical aspects. Review by TheMarquisDeSuave from the Internet Movie Database.